When & where is Jam On The River? 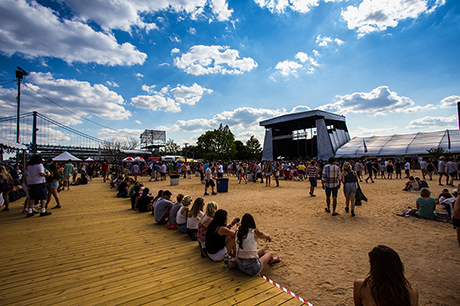 Festival Pier at Penn’s Landing on Spring Garden & Columbus Blvd – Philadelphia, PA on Saturday, May 16th, 2015. Why did Jam On The River move to a new location in 2015? The 2015 performance schedule will be released closer to the show date. No professional cameras are permitted inside Festival Pier. Professional camera is defined as a camera with a removable lens. Pets are not allowed on the property or in the concert venue, except for service animals. All children, ages 2 and over are required to have a ticket for the event. Jam On The River is rain or shine. Where can I pick up Will Call tickets on the day of show? Festival Pier Will Call is located at the main entrance of the venue. Photo ID and credit card used to purchase event tickets must be presented in order to receive event tickets. How do we get there via public trans? Lost & Found is located at the Guest Services office located near the main entrance of Festival Pier. Maybe, email press@JamOnTheRiver.com for press requests. While all artists are confirmed to play Jam On The River, artists are subject to change without notice. Refunds will not be issued if an artist cancels. There are several ATMs located inside Festival Pier. Please note that most vendors accept debit and credit cards for purchases. There are several parking lots adjacent to Festival Pier available for a fee. There is also limited, metered street parking on Columbus Boulevard / Delaware Avenue. All hand carried items, including backpacks, belt bags and purses will be searched. Guests are encouraged to keep nonessential items in their vehicles. Copyright © 2015 Jam On The River. All Rights Reserved.